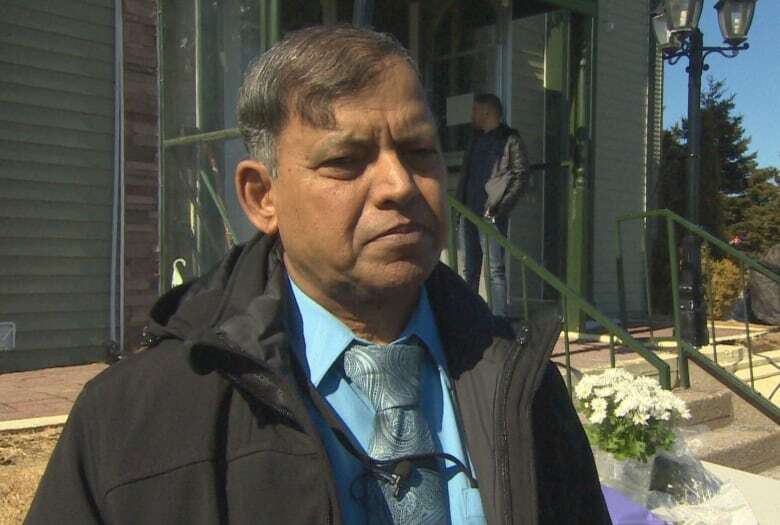 Worshippers in St. John's honoured the dead Friday afternoon, while neighbours dropped off flowers and messages of support at the neighbourhood mosque — providing a small ray of hope for Muslim Canadians as they mourn. The Muslim community and its allies in St John's are in mourning after 49 people were killed in a terror attack that targeted houses of worship in Christchurch, New Zealand Friday. Haseen Khan, treasurer of the Muslim Assoc. of Newfoundland and Labrador, described the event in detail during Friday's Jum'aa prayer service inside the island's only mosque, Masjid-an-Noor. Khan, who led the prayers, referenced police and media reports from Christchurch to piece together what happened to the community's "brothers and sisters" in Oceania. "A gunman dressed in black, wearing a helmet, carrying a machine gun, entered from the back door and began firing," Khan said, condemning the attack as an "inhuman, deliberate and evil" act. "It was a well-planned terrorist attack against harmless and peaceful worshippers." Those at the mosque Friday meditated on the mass shooting as though it happened here at home rather than half a world away, touching their heads to the floor or kneeling in pensive silence as Khan continued. "Hundreds of bullet shells were on the mosque floor, along with dead and injured worshippers, including women and children, lying in a pool of blood in each and every corner of the mosque," he said. "Many of us are thinking, it could have been my mosque." RCMP officers, as well as CBC News, were welcomed into Masjid-an-Noor during the service. Security was heightened at a number of Islamic sites across Canada following the attacks. At Confederation Building, flags flew at half-mast to honour the victims. "This kind of violence is unacceptable. Out of respect, and as a symbol of sorrow, the flags will remain lowered until sunrise," said a statement from the provincial executive council. Khan said the mosque has "received [an] outpouring of support" both from political leaders and the wider community. When he arrived this morning to prepare for the service, he said, he was welcomed by flowers and notes of support laid at the front door. "There are people who stand with us," he said, adding that there's a small gleam of hope to be found in the darkness of the tragedy. "That's what we try to instill in our children. That there are good people. There are civilized people, who always stand with us, feet to feet and shoulder to shoulder, during any crisis," he said. "These are the messages of support which we use to comfort ourselves and our children ... This is what we take pride in. "This is why we are proud to call ourselves Canadians."